Looking for insects, a palm warbler inspects goldenrod that has already bloomed. Palm warblers forage in weedy fields as they migrate through our area in late September and early October. Changing fall foliage and the bounty of the harvest lend a sense of excitement to early fall days, but the season also brings us a chance to spot fall travelers that we see only when they pass through our area, such as palm warblers. Palm warblers (Dendroica palmarum) don’t breed here in the spring or stay here for the winter. Instead they migrate back and forth between very different environments in distant places. Their breeding grounds are spruce bogs in Canadian forests, and their wintering grounds include the southeastern U.S., from North Carolina to Florida and Louisiana, and the Caribbean. Warblers, or wood warblers, are a treat to see because they’re small, quick, and often colorful birds. They’re native to the Americas. Catching sight of one usually isn’t easy because they tend to spend most of their time darting around high in the leafy treetops, snatching insects from leaves and twigs. People who like to watch them – or try to watch them – often complain of a sore “warbler neck” from standing around looking up for too long. But we’re in luck because migrating palm warblers are more likely than many other warblers to be flitting around down low in open areas, checking out weedy fields for insects to fuel up on. They also sometimes feed on the ground. So when they pass though Westborough, you might actually get to see one. 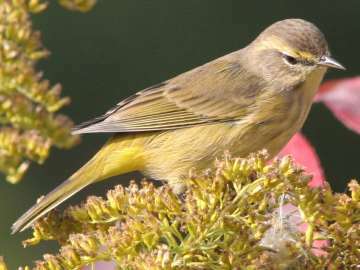 Look for palm warblers in fields with nearby cover – perhaps some shrubs or a woodland edge – or nearby water. They also like older fields with some young gray birch trees (Betula populifolia). As insect eaters, they might occasionally nibble seeds or fruit, but they’re unlikely to show up at bird feeders. In the fall, palm warblers are less brightly colored than they are in the spring breeding season, but they still have quite a bit of yellow on them, especially under the tail and on the breast and eyebrow, as this week’s photo shows. Their habit of pumping their tail up and down can help you recognize them. They do this when they’re perched on a branch or walking on the ground. What’s this tail pumping all about, anyway? No one knows, at least so far, but it’s a habit shared by some other birds that frequent open areas, such as eastern phoebes (Sayornis phoebe). Maybe it creates air currents that stir up small insects. Migrating palm warblers often travel in the company of other birds, not just their own kind. You might find them with yellow-rumped warblers (Dendroica coronata), which like to feast on poison ivy berries in the fall, and pine warblers (Dendroica pinus), as well as chipping sparrows (Spizella passerina) and eastern bluebirds (Sialis sialis). So look for palm warblers if you notice any of these other birds. It’s odd to think of wild birds as fattening up – after all, they’re not squirrels – but that’s exactly what migrating birds do before they set off on their long fall and spring journeys. Palm warblers fatten up on the flush of insects in the short summer of their far-northern breeding grounds (after feeding their chicks on them). Of course, birds can’t fatten up too much, because they have to be able to fly. Migrating birds burn a lot of energy during their long flights, depleting their reserves, so it’s critical for them to be able to feed along the way, especially in cool weather. At temperatures in the 30s and 40s, a warbler the size of a palm warbler might not survive a day without eating. Westborough may not be a famous stop-over site for migrating birds, but the natural bounty of our woods and fields helps us do our part. Migration is demanding and perilous. The annual survival rate for adult migrating birds is about 50 percent. Those don’t seem like the great odds, do they? But they’re better than the odds for birds that live year-round in temperate areas (think of our black-capped chickadees and cardinals, for example). Such year-round residents have yearly survival odds of only 20-50 percent for adults, undoubtedly due to cold winters. Birds that live year-round in the tropics fare better, with 80-90 percent yearly survival odds for adults. Like many migrating birds, palm warblers travel mainly at night, but they may also move along locally as they feed during the day. Why the night travel? It has several advantages. Night poses less danger from predators such as hawks and gulls, which migrate during the day. Night travel also makes it possible to refuel by foraging during the day. Another big advantage is that night air is more stable, without the local heating and cooling from changing sunlight, so it makes for easier flying. How do these night travelers know where they’re going? When they take off for their journeys shortly after sunset, they use the setting sun as a reference point – it’s in the west. They also use sunset’s strongly polarized light (light waves that vibrate back and forth together). Throughout the night, they depend heavily on the stars, especially the positions of the constellations that are near the North Star and appear to rotate around it. Oddly enough, the name palm warbler isn’t a particularly good description of these birds. There are palm trees in many places where these birds spend the winter, but palm warblers don’t make any special use of them. Apparently they got their name just because European settlers first noticed them in palm groves in the Caribbean. The name “warbler” doesn’t describe them especially well, either, because their song – which you’re more likely to hear in the spring – is rather simple and plain. Many other warblers have more musical or varied songs. But palm warblers are nevertheless closely related to other warblers. Let’s hope that the palm warblers and other migrating birds we see make it safely to their winter destinations. And let’s look forward to seeing palm warblers again when they pass through our area again in the spring. Watch for them in late April and early May.